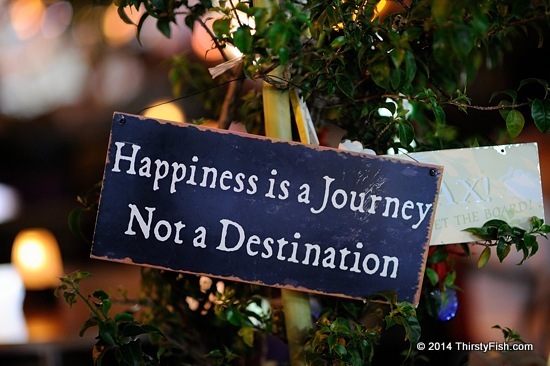 Happiness Is a Journey, Not a Destination? "Happiness Is a Journey, Not a Destination". Is it? A better way to ask that could be, is happiness a goal - whether immediate or future - or is it a consequence? A psychopath could well be happy throughout his or her journey so long as he or she gets what he or she wants. Thomas Jefferson wrote: "The equal rights of man, and the happiness of every individual, are now acknowledged to be the only legitimate objects of government". Is "personal happiness" of its citizens really the object of government? Or, is it more like, you are free to do what we want you to do? The Declaration of Independence frames the Pursuit of Happiness as an "unalienable right", or in his original draft of the Decleartion, Jefferson called it an "inherent and inalienable right". Yes, it may be a "right" to pursue happiness, but is it a worthwhile pursuit? Are there any "higher" things to pursue?